I have been coming to this street for too many years. I escaped the death sentence of the local Junior High School by going to The Bank Street School for Children for two years. I was always intrigued by the city, it’s history, every facet of it’s history, and how it got that way. Now that my children are enrolled, and have been so for many years, at one of the greatest schools ever to be born of this city (and I firmly believe that New York City is the only city in the world where Elisabeth Irwin and Lucy Sprague Mitchell could flourish), it was time to spend a little time on this block. The above picture is looking north from the east side of Broadway from West 111th. The picture was taken sometime after the subway opened in 1904. How do I know that? There are no trees in the center island of Broadway, they had to be removed during construction of what is now the Number 1 Line, but look at those massive tree trunks on the right. The Home to the Bank Street Book Store is there on the left. 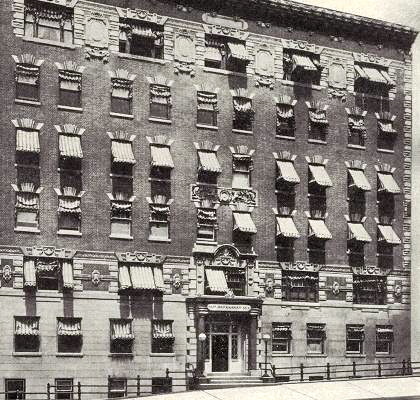 This is the The Maranamay, 611 West 112th. It is the building across from the school that has been in various stages of dilapidation since the 1970’s. At one point there were as many as 60 bicycles chained up to the iron rail outside as the population of the building was predominantly in the food delivery trade. The 6, 7 and 8 room apartments were cut up over the years and at one point small rooms created by these “renovations” would hold up to 6 people. The brochure for the building points out all the features of the neighborhood, the proximity to Saint John the Divine, Columbia University, Horace Mann, the Broadway Surface Cars and the Subway at 110th Street. The building boasted steam heat, hot water, hall and elevator service all day and all night, and phone connections for local and long distance. 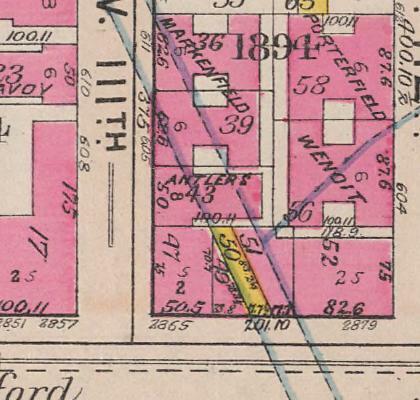 This is a map of the block from 1896. There is nothing on the block that is still with us. 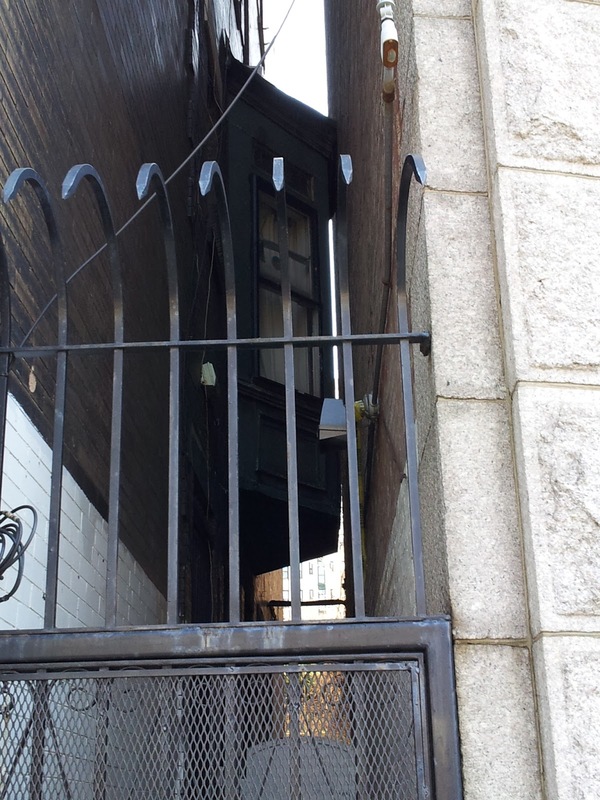 In fact only some of the single family homes on the south side of west 114th street are still with us. The dark shape on Riverside was the 1884 George Noakes House, soon to be replaced by an apartment building and two extant townhouses. The corner of 112th and Riverside Drive (the service road anyway) is the St. Christopher Home. What is surprising is how much still undeveloped land there is on the block and surrounding area. By 1896, those in the real estate business knew that there was a subway coming, Columbia University knew what it was doing when it started building it's Acropolis at 116th street. This area was going to explode with development, or so it was hoped. This is 1911. What a difference 15 years make. 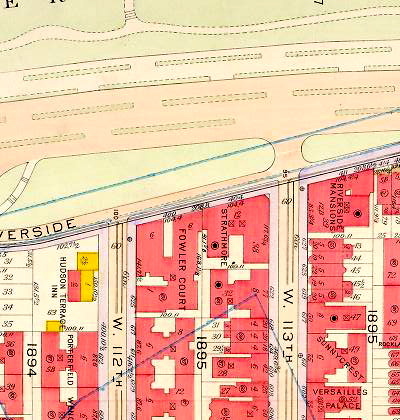 After 1896 Morningside Heights, as the area north of 110th street, south of 123rd street with Riverside Drive on the west and Morningside Drive on the east is called, saw a great deal of change as you can see. Now that this area was accessible, it became desirable. Claremont Hall, The Clarendon, The Maranamay and Fowler Court (400 Riverside Drive) line the north side still. The Porterfield and The Wendit are no longer with us as this is the footprint of the Bank Street College of Education. The Saint Christopher Home is now The Riverview Hotel and the building that is home to The Bank Street Book Store is there. 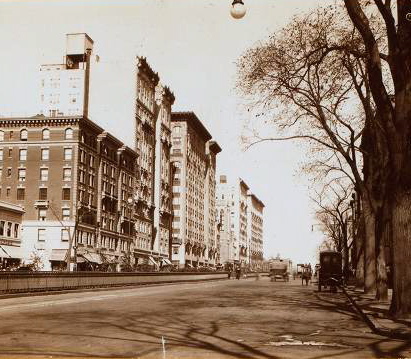 This is 1916 and the Riverview is now The Hudson Terrace Inn. 404 Riverside is on the earlier map but now it has a name, Strathmore, which can still be seen very faded on the south facing facade overlooking Fowler Court. The Riverside Mansion (410 Riverside Drive) was built in 1909, replacing the Noakes House. The townhouse to the right (or to the north of 410 Riverside) had to have gone up earlier. The Heyday of townhouse construction along Riverside was dwindling by 1909. It would make sense that the townhouses came first and large apartment buildings, like 410 Riverside Drive, came after. 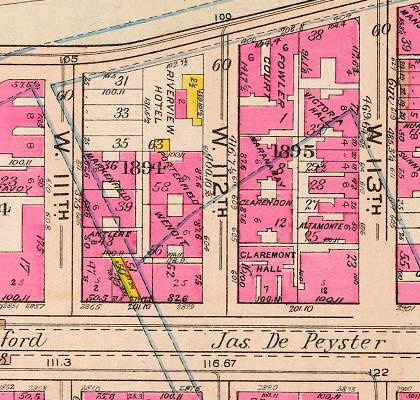 What I am suggesting is that the two townhouses just north of 410 Riverside Drive were built while the Noakes House was still there. the Noakes house sat in the center (or there about) of the property. 410 Riverside was built right up to the property line, thus obliterating the view and the use of this bay window. This sort of thing has happened before, it continues to happen now and will continue in the future. This is detail of the 1916 map. The little triangular building next to the yellow strip (indicating a wood frame building) is the home today of Samad's Delicatessen. The two buildings to the north sit in the foot print of what was once upon a time known as Asylum Lane. The site of Columbia University was once the home the The Bloomingdale Insane Asylum of New York Hospital. Having started in lower Manhattan and opening up here in 1821, New York Hospital began buying land in this area in 1811. This location was chosen for the asylum as it was believed that the rural setting and farm work was therapeutic. Not long after, the Leak & Watts orphanage buys a piece of land from New York Hospital and opens in 1843. Eventually they sell their land to the Episcopal Church for what will become Saint John the Divine - but that is another story. The Asylum Lane was an off shoot of the old Bloomingdale Road, a road that was eventually conformed, in parts, to the street grid of 1811. 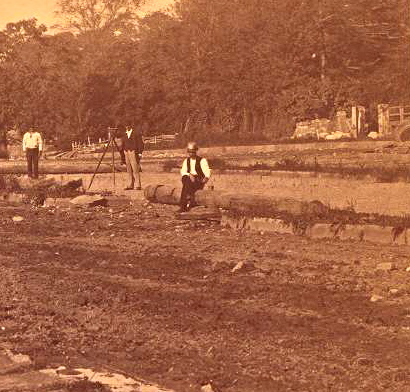 Originally the lane started near the Hudson River at what is now 111th street as there had been a ferry boat landing. This is looking north from what is now 112th street and Riverside Drive. The gate in the background on the right of the man seated, on what appears to be a pipe, I believe is the gate to what was then probably a private home but eventually the Saint Christopher Home and later the Hudson Terrace Inn. Just to the left of the surveyor is the entrance to the Noakes property. 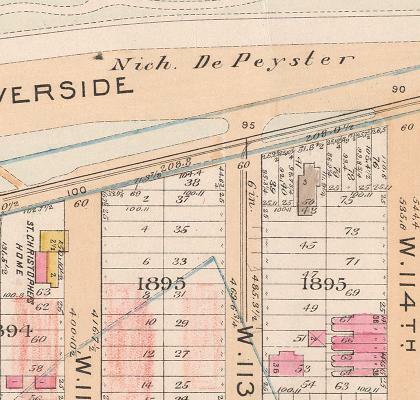 This is 1879 and Riverside Avenue, as it was briefly called, was going to be the next millionaire's row rivaling Fifth Avenue. It did not quite happen as hoped for. The institutions in the area as well as the New York Central tracks along the Hudson did not help. There were other factors as well, some having to do with wanting to remain where the Astors, Vanderbilts, Carnegie's and the like had established their homes. Other factors were less obvious but anti - Semitic attitudes of the day prevailed. The undeveloped west side was were wealthy Jews could buy, or have built for them, homes. Again, another story but look at the names of the architects working on the West Side at the turn of the century and look at the names of those working on the east side at the same stime. You would never see the Blum Brothers, Schwartz and Gross or even Gaetan Aijello working on the east side back then. The construction and opening of this avenue was delayed by the numerous lawsuits involving land ownership and eminent domain laws. Wealthy individual landowners along the what became the drive disputed with the city about where their land ended and where the city could build it's road. Gary, great to find your posts. I share your interest in the history of our neighborhood. You may recall I interviewed you for a radio show I produced in 2006-7. It was the day Humphrey Bogart Place was unveiled. Thank you for your service to our collective understanding of this great community.